A delay in the blog this week as we were in London for a few days. 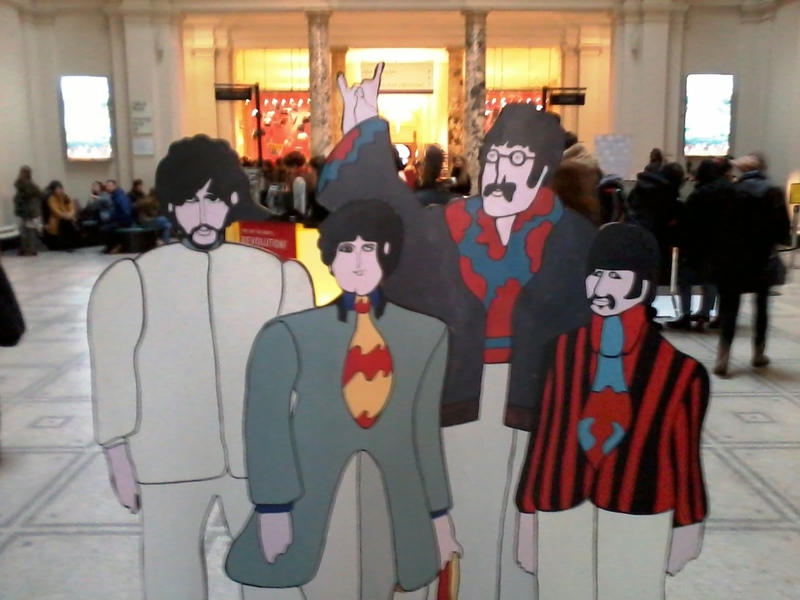 We both went to the outstanding Victoria and Albert Museum to see the exhibition entitled You Say You Want a Revolution? Records and Rebels 1966 – 1970 . This is a fascinating exhibition, particularly for people who remember the 1960s and the bands such as The Beatles, The Animals and The Who, amongst many others. When you go into the exhibition, there is a free audio provided. This is not your usual audio guide to exhibits, but is a soundtrack (list of songs here)of the music of the middle and late 1960s. Some people found this distracting e.g. looking at John Lennon’s written lyrics to Help while the soundtrack is playing Barry McGuire’s Eve of Destruction. The exhibition covers the 1960s revolutions in music, protest, fashion and consumption. It has a vast number of exhibits, perhaps too many to take in during one visit, including photographs, letters, TV coverage, film, clothes and consumer items. It is a very stimulating exhibition, taking in the trivialities of some pop music to the horrors of the Vietnam war and civil rights violence. The V&A of course is always a pleasure to visit, with its numerous rooms and hallways full of statues. Even if you only visit the ornately decorated tea room (good photos), with the William Morris room adjacent to it, you are assured a superb aesthetic experience. No photos were allowed in the exhibition but I took one on my mobile phone’s (not very good) camera of the entrance. My treat on Sunday evening was to go to the Royal Festival Hall for the T S Eliot Poetry Prize readings. The competition for the best collection is worth £20,000 to the winner. One of the best things about this event is that, while the 10 poets read from their collections, the winner is not announced until later – no annoying Masterchef pauses here. The readings were compered by the irrepressible Ian McMillan whose amusing but very perceptive introductions to each poet added much to the occasion. In one introduction, he referred to his Uncle Harry who had “sticky-out false teeth – like a pub piano”. He also summed up the quality of the evening by pointing out that despite the vast hall and the hundreds of people in the audience, when each poet spoke, it was like being in a small room with only a few people. Two of the poets, J O Morgan and Alice Oswald (the favourite to win) recited their poems from memory and made a substantial impact on the audience. 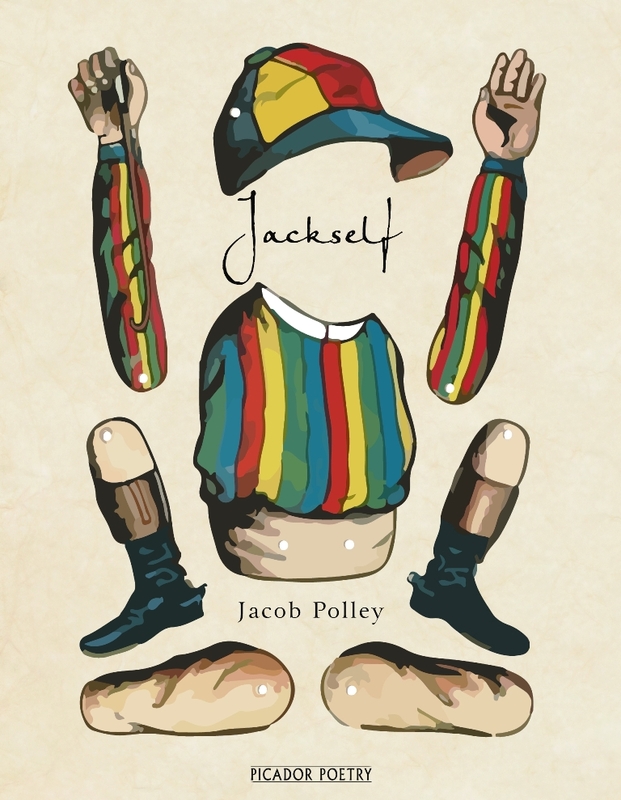 The winner, announced on Monday, was Jacob Polley’s collection Jackself which the judges called “a firecracker of a book” in which the main character can change into different shapes and things. I intend to buy this book, so more on this later. This posting is rather late as we went down to London for the weekend last Thursday. We stayed in a hotel just around the corner from the London Eye, the huge Ferris wheel overlooking the River Thames. It’s an impressive piece of modern engineering but you do wonder what those who built Big Ben across the river might have thought if they could see into the future and look across to the Eye. 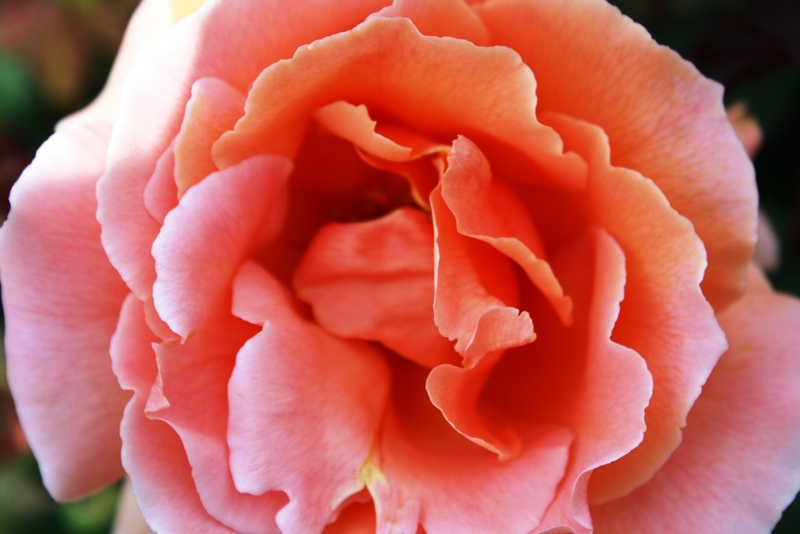 The photo below was taken on the manual focus setting as my camera has a problem – it will not take photos with the automatic focus on. On Friday, we went to the Victoria and Albert Museum which is one of our favourite haunts when visiting London. It’s a vast complex of rooms with ” unrivalled collections of contemporary and historic art and design” and you can go from huge castings of Roman columns to miniature paintings and jewellery within a few minutes. We elected to go to the exhibition of the mid 19th century photography of Julia Margaret Cameron. There’s an excellent video on her on the Vimeo site by the curator of the exhibition. Cameron was a wealthy woman who took photographs of her family, her friends and acquaintances (some famous such as Charles Darwin) and her servants, who posed for many photographs in which Cameron tried to combine art and photography. The photos below – reproduced under Creative Commons from the National Media Museum – show examples of Cameron’s remarkable work and, given that the photos are 150 years old, the clarity is remarkable. We also went to see the Europe 1600-1815 exhibition and there were some beautiful rooms on display as well as some remarkably detailed pieces of furniture such as The Endymion Cabinet (very good silent video). Another outstanding feature was the Mirrored Room with its centrepiece a harp. You can see the room and listen to an audio description here. There are endless visits to the V&A and you’ll never live long enough to see them all, but what a wonderful place to go back to. It was a busy weekend and coincided with my nephew Sid’s 21st birthday on Sunday. On Friday evening, we went to the excellent The French Table restaurant in Surbiton and this will be featured in the next posting. The original purpose of going to London was for me to go to The Royal Festival Hall for the T S Eliot Prize for Poetry readings, featuring many of the shortlisted poets. The evening was hosted by the distinguished poet and excellent presenter Ian McMillan who joked that his taxi driver had summed up an evening of poetry readings as “Another bloody do for people who wear cravats”. As McMillan said, although the Royal Festival Hall is a huge venue, when the individual poets were reading there was an intimate feeling in the hall. It was an inspiring evening as well as being entertaining, with McMillan’s introductions and anecdotes from Don Paterson. Below is the cover of the booklet given to the audience. The winner – announced the following day at the V&A – was Sarah Howe for her collection A Loop of Jade. A weekend away for my wife and me ( nearly wrote “my wife and I” but you can’t have “for I”) to the village of Warkworth in Northumberland, where we stayed at the very classy Roxbro House, which has ornately decorated rooms, excellent staff, an excellent breakfast menu (including delicious half peaches with raspberries) and complimentary cheese and wine between 5pm and 6pm – great value for money. It is situated just opposite Warkworth Castle with its magnificent stone walls and hilltop location, ensuring that the Percy family, which owned the castle and most of the land as far as the eye could see in the 14th and 15th centuries, could see their enemies approaching. Warkworth is a lovely village and you can walk around the village along the Coquet River, where I counted 27 swans in one group, gliding along this slow-moving river. One of the highlights of the trip was a visit to The Alnwick Garden, probably best known for its grand cascade, a huge man-made waterfall, with intermittent weirs, down which thousands of gallons of water fall each minute. 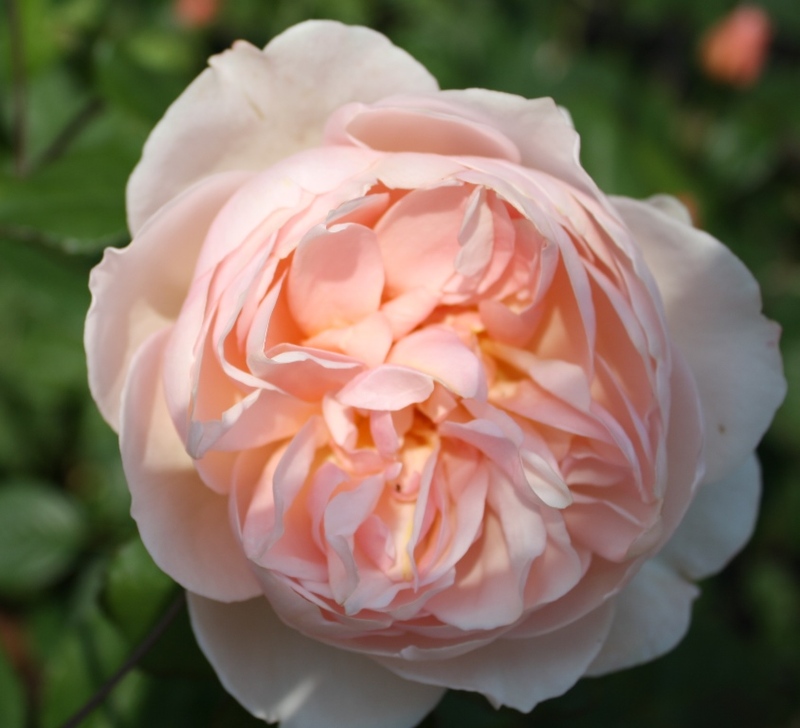 It’s a very extensive garden, with many different sections, such as the rose garden, which has an outstanding variety of roses of different colours, sizes and perfumes. 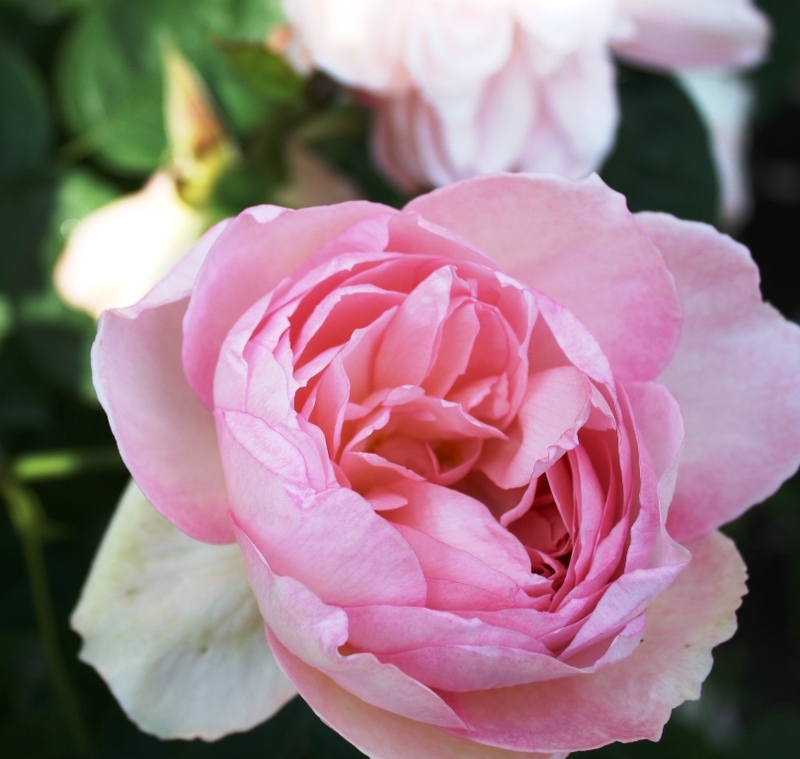 Photos 1-3 show some examples of the roses on display. The garden also includes a cherry orchard, woodland walk and serpent garden. It’s fairly expensive to get in but you could easily spend a few hours here, especially on a warm sunny day. I was downloading a BBC Radio 4 podcast this morning, to listen to on my bike ride, when I noticed at the bottom of the screen, an icon for a programme on Radio 3 called The Verb and discovered a new place in which you can listen to people talking about words and literature and music. The show is presented by the excellent Ian McMillan and it covers, in its own words “Exploring different worlds of language, dialects, rarities and curiosities and how spoken and written language interact”. The programme I listened to today came from Derry/Londonderry (the correct reference to this once very divided city) which is the 2013 City of Culture) and featured a writer’s description of days during which he cannot write with any conviction, partly because his brain is full of porridge which has been left to harden in a pot, an exploration of the song Danny Boy and 2 songs by an up and coming singer. An excellent find and worth checking out – it is available worldwide.